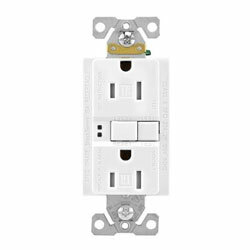 Arrow Hart Self-Test GFCI receptacles are UL Listed and fully compliant with all of the latest UL943 Class A GFCI and UL498 requirements. The Self-Test GFCIs conduct an automatic test periodically to ensure GFCI protection. The device will trip and will not reset if GFCI protection is not available.